Pro-Line is back in action with boats like their 23 Sport center console, which maximizes value for the LOA. When Baja Marine first acquired Pro-Line Boats, boats.com contributor Matt Trulio quoted CEO Johnny Walker in Forecasting the Future of Baja, Donzi, Fountain, and Pro-Line as saying that Pro-Line “offers the best value at the best price on the market.” That’s a big claim, but after checking out a new Pro-Line 23 Sport, it’s not one we’re going to argue with. 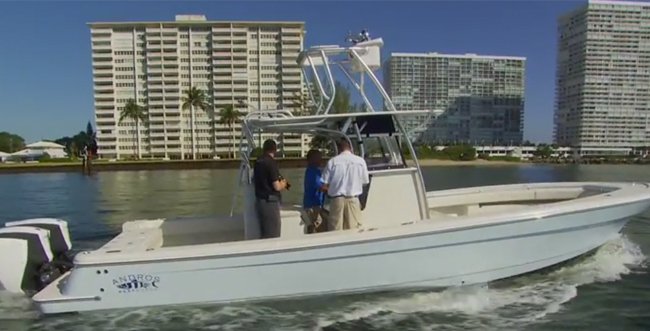 The proof is in the numbers; equipped with a 200-hp four-stroke outboard, the 23 Sport MSRP’s at just over $54,000. Most similarly-equipped competing boats in this class are going to be closer to $60,000, with many going well beyond that mark. Does the Pro-Line 23 Sport really give you the most bang for your buck? Let's find out. The words “similarly equipped” in the sentence above are key. Note that the Pro-Line’s standard equipment list includes goodies like a livewell, raw water washdown, a compass, six horizontal rodracks, a pair of gunwale rod holders, a swim platform with ladder, and trim tabs. 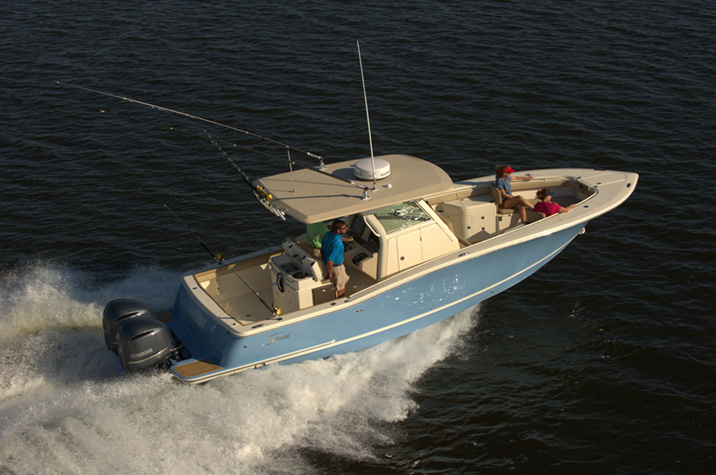 My guess is that most boaters will want to add the T-top (about $5,000) but other than that, the 23 Sport is ready for fishing right out of the box. Wait a sec—how to they keep that price tag down? Is the boat under-built, to save cost? Nope—it comes with a 10-year structural hull warranty, backing up the foam-filled fiberglass stringers and hand-laid hull. But Pro-Line doesn't cram on a bunch of high-dollar gadgets and graphics that add a ton of cost; you won’t find any electrically-actuated windshield vents, convertible furniture, or built-in grills and wet-bars. 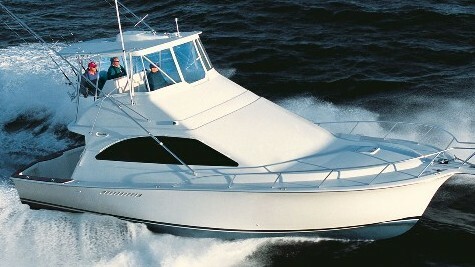 Instead, Pro-Line takes a fairly simple, straightforward approach to center console boat design. And for those of us who are interested purely in fishing, that’s just fine—we’re perfectly happy to take the money we saved on goodies and gadgets and spend it on extra fuel and bait, thank you very much. With that fuel in the tank and that bait inside one of the two integrated bow fishboxes or in the Igloo cooler under the leaning post, it’s time to fish. 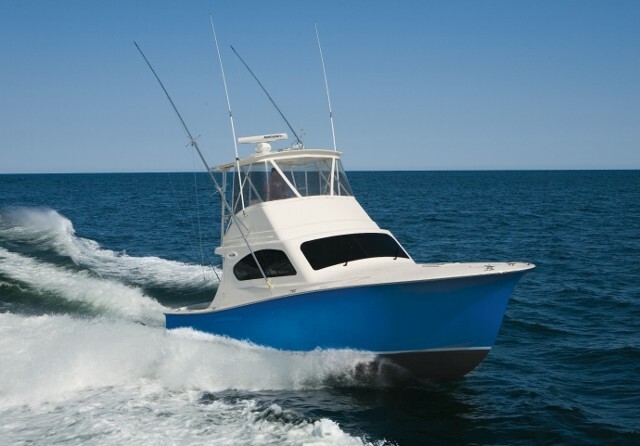 Remove the forward cushions and stand on the elevated foredeck to cast, or move back into the cockpit and fold away the transom bench seat to open up more fishing space. One beef back here: the raw water washdown sticks out where it can be inadvertently kicked; I’d rather sacrifice one of the horizontal racks, and have it facing forward next to the inwales where it’s out of the way. Take note of the gunwale bolsters which are removable for easy cleaning, and the fact that the T-top’s forward supports mount to the console, not the deck, to eliminate a common tripping-point found on many boats of this type. The lay-out is pure fishing, through and through. Even though fishability is our main concern, however, we anglers do enjoy breezing out to the hotspots at blistering speeds. No worries, there. 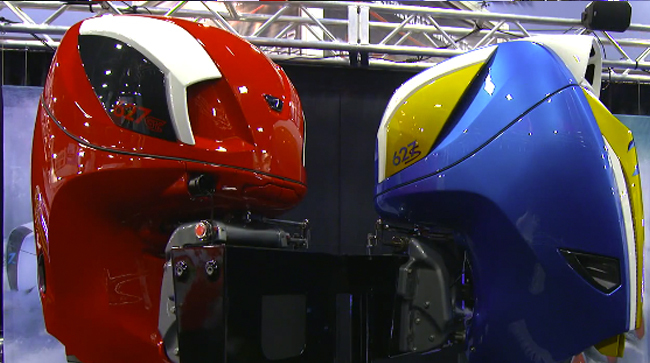 Even with the base 200-hp powerplant you can expect to break 40-mph at top-end. Opt up to a 250-hp outboard and speeds jump into the upper 40’s. And with the maximum power of 300 horses, a top-end of 50-mph is not out of reach. What if you’re one of those fishermen who like to jazz things up a bit? Consider getting the 23 in the Hemmingway Edition. Pro-Line offers their boats with an added level of trim and trappings a lá Earnest Hemmingway with this package, which includes visual pleasures such as a hull wrap that matches the Pilar’s hull colors, upgraded interior color-matching fabrics on the cushions, and powder-coating on the T-top. 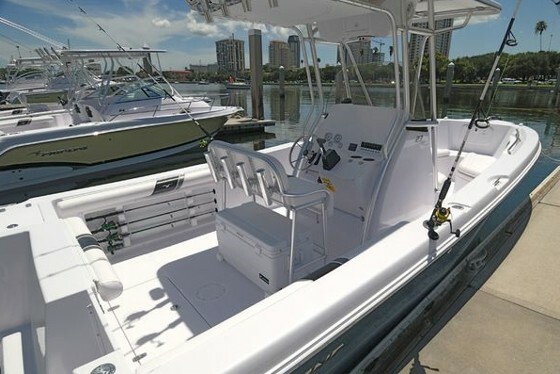 It’s not cheap (cost is close to $20K) but it does also come with more substantial upgrades as well, including the T-top itself with extra rocket launchers, extra gunwale rodholders, a MSD in the console, spreader lights, seating upgrades, and more. Personally I’d stick with the standard-issue 23 Sport—that much cash buys a lot of ballyhoo—but if you place a lot of value in fashion, you’d be buying most of the other upgrades in any case, and you happen to be a Hemmingway fan, this is a package that other builders can’t offer. So, what’s the bottom line? Does the Pro-Line 23 Sport truly offer “the best value for the best price”? Hey, it’s your money and that means this is a judgment call that only you can make. 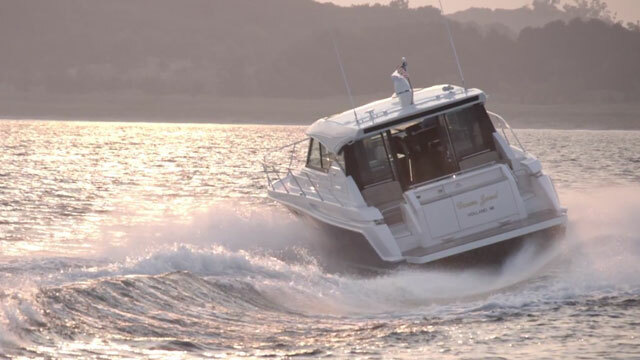 But one thing’s for sure: Walker’s claim is easily defended, and this boat is a serious contender when it comes to getting the best bang for your buck. Of that, there can be no argument. 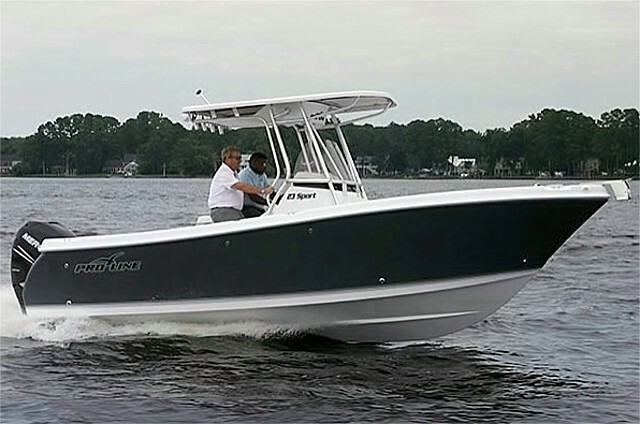 Other Choices: If you’re willing to spend at least 15 to 30 percent more, you could check out boats like the Regulator 23 or the Boston Whaler Dauntless 230. At the other end of the spectrum, the Sportsman’s Heritage 229 is slightly smaller and lighter, and costs a few thousand dollars less than the Pro-Line 230 Sport. Have a look at some Pro-Line 23 Sport listings. 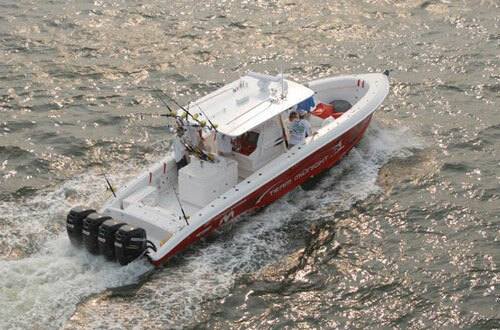 For more information, visit Pro-Line Boats.